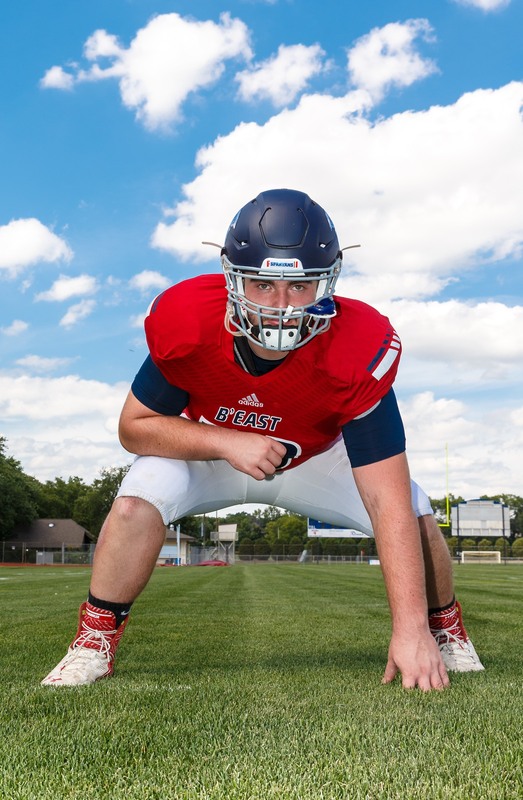 Whenever you try to interview Brookfield East's All-State running back/linebacker Sam Santiago-Lloyd, one of the first people he wants to talk about is Max Aslin and his offensive line buddies who open the holes for him. "We just want to make sure Sam's got an open lane," Aslin said. "With Sam behind us, it makes my job a lot easier. A running back as good as Sam, seeing the holes even if they're small. As long as you keep trying, Sam has a good chance to break one." When talking about the 6-foot, 3 inch Aslin, there is never a question about his effort - on or off the field. Ask Jake Hoerchner, East's new offensive line coach and former player at North Dakota University. "He's a guy that finishes," Hoerchner said. "He goes from the snap of the ball to the whistle and that's what I like the most about Max. He is willing to put in all that extra work, effort and he is willing to go that 100 percent whether it's a walk through or going full go. "He is always giving it his all. That's something I really noticed these first couple of weeks. His effort is everything, so I think that's what's gotten him this far and it's going to get him through the season." Aslin is in his third season on the varsity - he was on special teams as a sophomore and was second-team All-Greater Metro Conference his junior year. East's offensive line, which returns Aslin at right guard, senior Max MacGillis at right tackle and junior Adam Streich at left guard. Juniors Matt Johnston is at left guard and Everett Cartier at left tackle. "It's an experienced and balanced group," Hoerchner said. "It makes my job easy with two big guys (Aslin, 285, MacGillis, 300) and then it takes six guys to take Sam down." New head coach Ben Farley, who was a member of retired Tom Swittel's staff, talked about the adjustment Aslin and his teammates are making. "We have a healthy balance of experienced guys who have been in big games," he said. "It's the same, but we put in some new things in the system and we're balancing that experience, getting out of our comfort zone, learning new things. improving every single day." And leading the pack is Aslin, who has already had an offer to attend Air Force Academy. "His leadership, his physical present - he's a tough kid," Farley said. "I see him being a big part of our football team, especially in the leadership role. "I am amazed how mature Max is. In our senior group, we do not have a ton of guys who will scream at you. But Max will step up and I respect that. He is also a guy who can come to me or come to his position coach, have an honest conversation and you respect it and trust him." Hoerchner emphasized Aslin led by example as well as verbally. "He's the first one to step up for a drill and demonstrate," he said. "He has led the way as far as communication and everything, not only up front with the offensive line, not only with the offense, but with the whole team. "He's one of those guys that anyone feels comfortable coming to if there's an issue with another player or something that we're doing in practice. If there is a concern, he's kind of a spokesperson for the team. He's been a leader with everything all summer." Aslin is as excited about his leadership role as he is facing small defensive backs when he reaches the second level on the football field. "I like to take on a leadership role," he said. "I usually do the warm-ups. I like to motivate people, keep them going because sometimes guys like to go a little slow. You got to bring up the intensity and get ready for game day. "I talk to a lot of players, tell them what they are supposed to be doing, give them tips and stuff like that. I make sure they can improve their game." When asked if his teammates look up to him he was quick to respond. "I think so. A lot of people ask me questions about things when they don't know what to do," he said. "It makes me feel good knowing I can help the program in the future and sustain the success we've been having." Aslin's leadership skills are huge, of course, but don't forget what he does on the field. Hoerchner smiled when asked what Aslin's strength was. "His strength is his strength," he laughed. "He is a strong, big kid. He's 6-3, probably (close to 300 pounds (actually 285). As a 17-18 year old that's pretty impressive. He's a monster in the weight room. His footwork; he doesn't move like a 300-pounder does. He has just as good as footwork as some of our running backs. "That's huge for him when he can get off the ball that fast and you're able to overpower some of the big 'D-lineman' in this conference. He's going to have a lot of success." Aslin was happy to see Farley get the head job after Swittel retired. "It helps a lot because he knows the program, he knows what we value, he knows the defensive side and he brought new people to refocus the offense," he said. "He knows the in and outs of practice time, the schedule and he knows to make sure we're not on the field too much. He makes sure we're ready to go by game day." 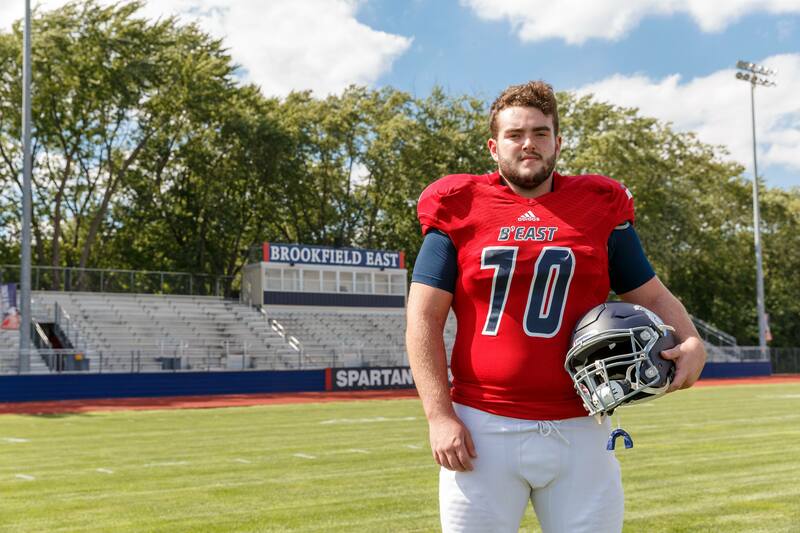 After going 10-2 overall and 6-1 in the GMC, the Spartans (2-0) open conference play on Sept. 2 against West Allis Central, Aslin is raring to get the important part of the schedule going.
" I think we have a lot of pieces coming back," he said. "And a lot pieces replacing the pieces we might have lost. I think we're going to have a lot of success this year in the GMC." And surely, Aslin will literally and figuratively be a big reason. FAVORITE FOOD: Ribs,anything with meat. FAVORITE MOVIE: Marvel Action, especially Captain America. FAVORITE PLACE YOU VISITED: Air Force Academy, Colorado. MOST MEMORABLE SPORTS MOMENT: Sam Santiago-Loyd's winning TD over Brookfield Central in playoffs. WHAT WOULD YOU LIKE TO DO IN THE FUTURE? Want to be a physical therapist.